European stocks may join a global sell-off on Tuesday amid fresh trade worries concerns. Stocks came under selling pressure once again yesterday and car maker Renault sank after the arrest of its CEO over financial misconduct allegations, with the DAX dropping almost 1% yesterday. Looking ahead, traders will be closely monitored simmering trade tensions after the rivalry between Washington and Beijing overshadowed a summit of Asia-Pacific leaders over the weekend. On the economical front, Germany's industrial producer prices rose at the fastest pace in 18 months during October, figures from the Federal Statistical Office showed earlier this morning. From a technical perspective, the German index kept moving lower throughout the whole session but ended up closing within the prior day's range at 11244 and above the 11200 support level. A bearish candlestick pattern however might be forming on the 4H chart, however should prices break the 11200 support level, downside momentum could speed up as the market gets close to new lows for the year at 11050. 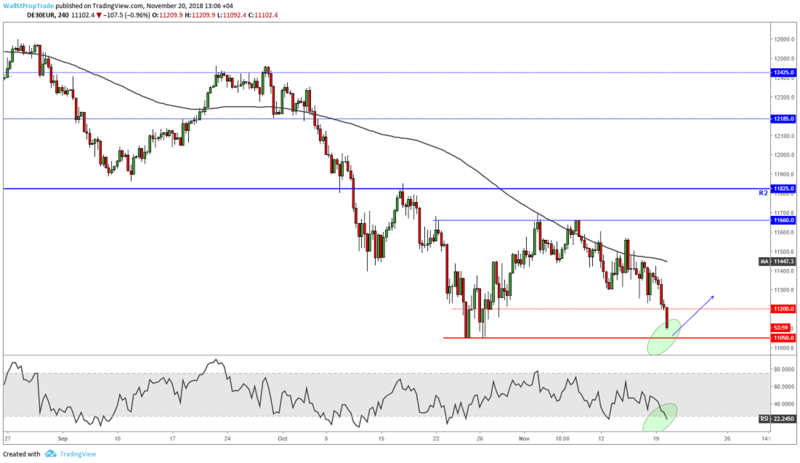 The RSI however is starting to signal oversold conditions suggesting the bulls might take control within the next few hours pushing the index back to the 100-period moving average.